Example 14 backups twice per day = 7 days, 16 backups = 8 days etc. Applies only to the additional backups. Select if you want to backup the images. Will only make 1 backup with the same name. File name will be, YourCompanyName_Latest.bkp. 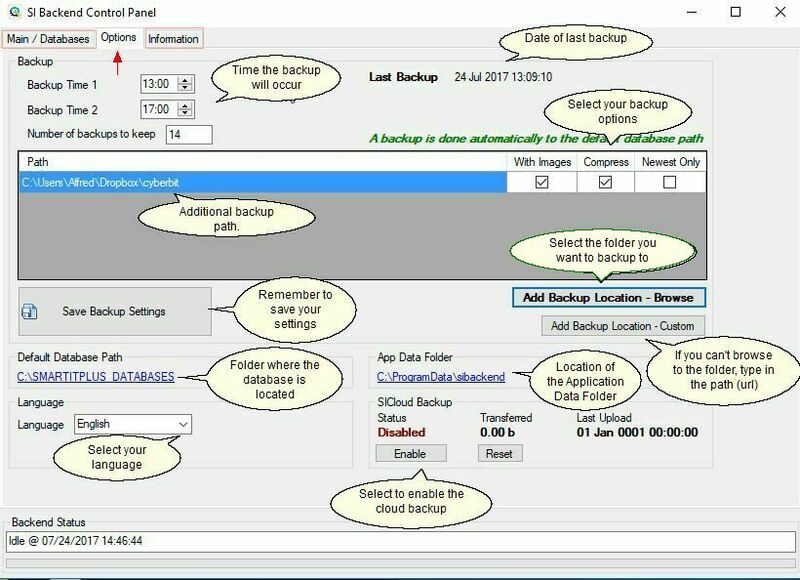 If you deselect this option then each backup will be added to the backup folder resulting in multiple backups that can take up a lot of space. This is probably not necessary as you do have 7days of backups (depending on your Number of Backups) that are done automatically. By using this feature you will be backing up your data to our Secure Cloud Server , allowing you up to 1GB of free data usage. To then retrieve any data/backup you simply need to contact us. The first back up will be a full data backup, thereafter this will occur in increments, thus minimizing band width. Please note, if your database is larger than 2Gb, your images will not be backed up. To activate this feature please select the Enable button. See image above. 1.That you have a License Client ID, located in the SI Backend Main Form, without which this function will not work. 2.To ensure you have a License Client ID, go to your SI Backend and select the renew/upgrade on the general tab and check in the first box should you not have a Client ID, please contact us to assist you. Please create an additional backup path for your Smart IT data. This is just as a precaution, should the server be stolen or is no longer able to function, this data can be restored on a new server. Enable the Cloud Backup feature. By using this feature you will be backing up your data to our Secure Cloud Server, allowing you up to 1GB of free data usage. Download Dropbox -http://www.dropbox.com (create a user name and password) - in the Backend select the Options tab > Add New Backup Location, select the Dropbox folder - uncheck the compress box (checked boxes should then be with images and newest only. Now you will also backup to Dropbox on the internet. It is recommended that you invest in an external hard drive, set the backup location (as explained above) connect the external drive and a backup is sent to this device, as a security policy, at the end of each day remove the external hard drive and either take it home with you or store in a safe.